In order to get an idea of what Reahl is, please take a tour of its features. Several defining features are listed there, with links to pages with more detail and examples. The Getting started guide will enable you to start experimenting and working with Reahl. To start learning Reahl in earnest, you can work through the web application tutorial. The Reahl web framework is built in terms of a collection of useful components geared for the development of server applications in Python. The component framework contains the infrastructure that enables Reahl’s brand of component-based development. It also allows a programmer to build domain models that are annotated with information used by user interface code. The core of the Reahl component framework is implemented in reahl-component . 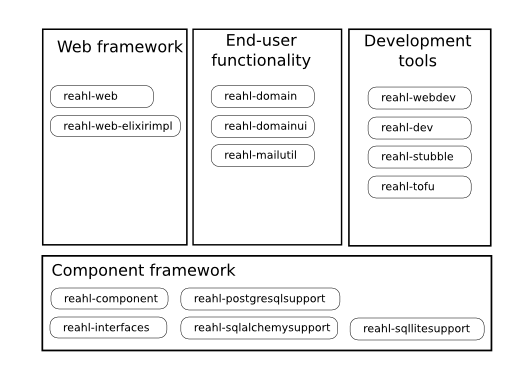 Interfaces for concepts defined by the Reahl component framework (but not implemented by it) are in reahl-interfaces . Support for different databases or ORM tools is implemented in separate components: reahl-postgresqlsupport , reahl-sqlalchemysupport and reahl-sqllitesupport . All of these components are discussed under the heading of Component framework. The web framework provides the tools for developing applications with web-based user interfaces. The core of the web framework is written such that it is independent of the technology used for object persistence. This core is in the reahl-web component. The web framework does use some objects that are persisted though – an implementation of these using Elixir is provided in reahl-web-elixirimpl . These components are discussed under Web framework. The end-user functionality included in the distribution of Reahl is split into two components: reahl-domain and reahl-domainui . The reahl-domain component contains the domain models and logic, whereas reahl-domainui provides the related web user interfaces. Simple support for sending emails is provided by reahl-mailutil . All these are discussed in Domain functionality. The reahl-tofu component contains an extension to the Nose unit test framework as well as a small collection of other test utilities which can be used with any test framework. Its reason for being is that it allows one to separate a test fixture from tests themselves. Stubble (in reahl-stubble ) enables one to write stub classes that will break if the interfaces of the classes they stub should change. Infrastructure is provided in reahl-dev and reahl-webdev for dealing with Reahl components using an extensible command line tool. This includes a web server for development purposes and a number of special tofu Fixtures that are useful when developing Reahl.